Inbound marketing is predicated upon the idea that the best way to grow your audience is to educate your audience. The trust built in this process will, over time, turn your audience into your customers. It’s a mutually beneficial approach to marketing, one that stands in stark contrast to the model of paying for eyeballs and sharing content that’s more about your products than it is about your audience’s problems. 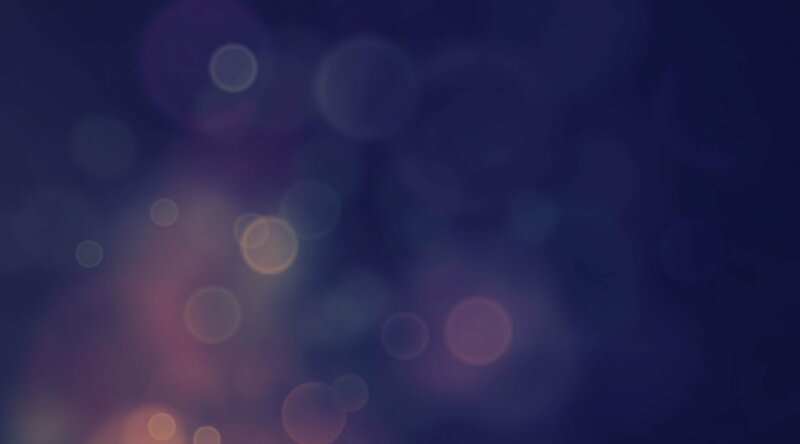 Live video is, therefore, a natural fit for inbound marketers. Like inbound or content marketing, live video offers an authentic way to engage your audience — more conversation, less spiel. Viewers tune in of their own accord, and, over time, they grow to know and trust you. Live video lets you share content that establishes your company as an expert in the industry while also solving your audience’s problems and interacting directly with them. So why exactly is live video so effective? Let’s take a look at a few of the top reasons. When so much content is available on-demand ("I'll save this and read/watch/listen later"), live video creates a sense of urgency. It triggers viewers’ FOMO and encourages them to tune in — and stay tuned in. On average, Facebook Live videos are watched three times longer than standard videos, and they generate 10 times as many comments in that time. Imagine what companies would be willing to pay to guarantee triple engagement from their print ads — or to get 10 times as much valuable feedback on their commercials. Live video provides this kind of engagement, but since you can stream it on owned media, it doesn't have to cost a thing. Viewers aren’t the only ones prioritizing live content. Facebook also rewards live-video creators, pinging your followers with a notification each time you go live. Facebook doesn’t offer that type of automatic outreach for any other type of post you create. They provide these notifications because their data show that viewers want to tune in while the action is happening. One reason for live video’s high engagement rates is that it humanizes your brand. In an age of filters and Photoshop, live video shows a more unscripted look at your company, team, and offerings. That’s true even if your company scripts and edits its videos with a live-editing platform. Live video will always offer a more authentic, behind-the-scenes experience because it's happening in real time. Commenting on a prerecorded video is sort of like leaving a message on an answering machine — someone might hear your message (if they ever check voicemail), but they definitely won’t respond immediately. Commenting on a live video is a totally different experience. 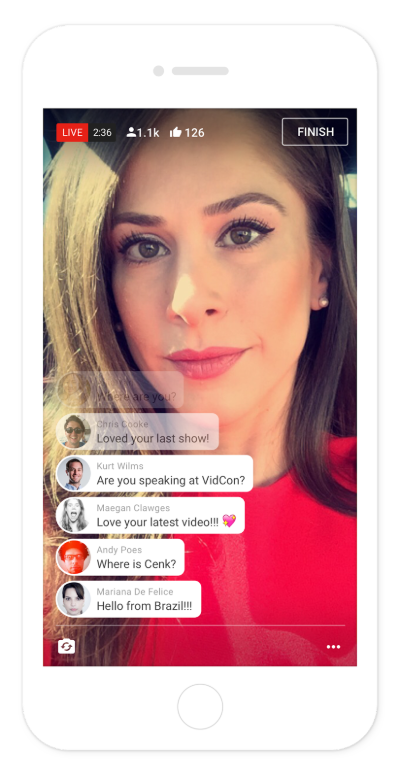 Facebook, YouTube, and Instagram, for instance, all let you see comments live as they roll in from viewers, letting you welcome audience members by name and respond to their questions on the fly. In this way, it’s basically a market researcher’s dream, creating a potential focus group out of every video. It’s easy to take the responses you get when you go live and use them to inform not only the trajectory of your video itself but also your entire content strategy. Let’s say you’re a specialty grocery store conducting a live video to educate viewers about the produce that’s in season. If you get a spike in comments and questions when you mention apples, that’s a pretty good indication that your viewers would like a later live video specifically about apple types for pie and tart recipes. If, in turn, the recipe videos perform better than the seasonal produce videos, you have a better idea of the type of content that might also perform well in a blog post or an email newsletter. All of this info can be gleaned because of the high engagement rates live video offers. Creating great content can be time-consuming when you factor in research, writing, editing, design, etc. One way to improve ROI on your time is to repurpose your content. That guide you meticulously researched and wrote? Turn it into an infographic to extend its usefulness. That blog post you spent days on? Use it as the basis for your next email newsletter. Repurposing extends the life of your valuable content, and live video is a fantastic way to repurpose content for additional audience members. If you’ve already spent time researching and writing about a topic, go live to share what you learned. It requires zero additional research but vastly increases the reach of your message. Or, if you’re going to be interviewing an expert or team member for a written piece, why not stream that interview? This creates almost no additional work but gives you an entirely new piece of content that will resonate with people who prefer video to written content (which, research shows, may be as many as 82% of people). Live videos also serve as great opportunities to promote your other marketing efforts. While live, invite viewers to subscribe to your email list, to download your white paper, or to sign up for your event. You’re communicating with them in real time, and they are engaged with you, so this is the perfect time to ask them to take the next step. Live video isn’t just compelling in the moment; it also has a long tail, functioning as useful educational information for audiences long after it’s produced. This is particularly true of live videos on YouTube, which is now the second-largest search engine in the world and one of the top sites people turn to when they’re seeking educational content. With descriptive titles and tags and a helpful thumbnail image, a video that you once streamed live can serve as evergreen educational content for awareness-stage buyers seeking info on YouTube. Awareness-stage audience members aren’t the only ones motivated to watch live videos, however. Whether you’re B2B or B2C, selling services or selling products, live video is also a great way to answer questions for people in the consideration stage. Take a service company, for instance. Let’s say you’re a hair salon seeking new customers. You could livestream a video of a stylist creating a balayage effect in a customer’s hair. For a viewer interested in this look, you’ve answered unspoken questions about the process, the length of time the treatment takes, and the end result — all while answering the literal questions about cost, technique, etc., that are rolling in from live viewers. And the whole time, you’re building a familiarity with your salon. A product company, on the other hands, can host a live show-and-tell with physical products while educating viewers about their use. If you're a company that sells car ramps, for instance, you could livestream an oil change. You'd be educating your audience while also building brand awareness and familiarity with your products. Next time viewers need to change their oil, they’ll know how, and who — which brand to buy a ramp from. These demonstrations could also be conveyed with prerecorded videos, of course, but live videos both increase viewership and enable viewers to ask questions throughout the process, an invaluable opportunity for both you and them. The ability to share expertise with actively engaged and responsive audiences is one of the greatest advantages of live video over prerecorded video for inbound marketers. Viewers love the personal interaction — and hearing their names in a broadcast doesn’t hurt either. As viewers learn from you, they’ll grow to see you as the industry expert to turn to when it’s time to buy. By now, you may be sold on live video but unsure how to implement it as part of your marketing efforts. You’re in luck. 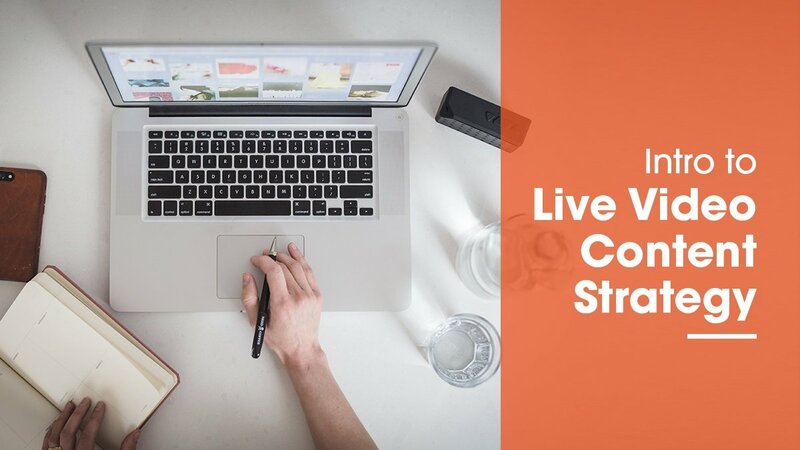 We’re starting two new blog series — Live Video Content Strategy and Live Video Technical How-Tos. These series will walk you through everything from planning, goal-setting, and promotion to lighting, audio, and Wi-Fi setups. And, though the series will be focused on marketers, live video is an effective medium for people in all sorts of fields. Journalists, coaches, teachers, speakers, influencers, and students are among the many people using live video to get their messages out there. 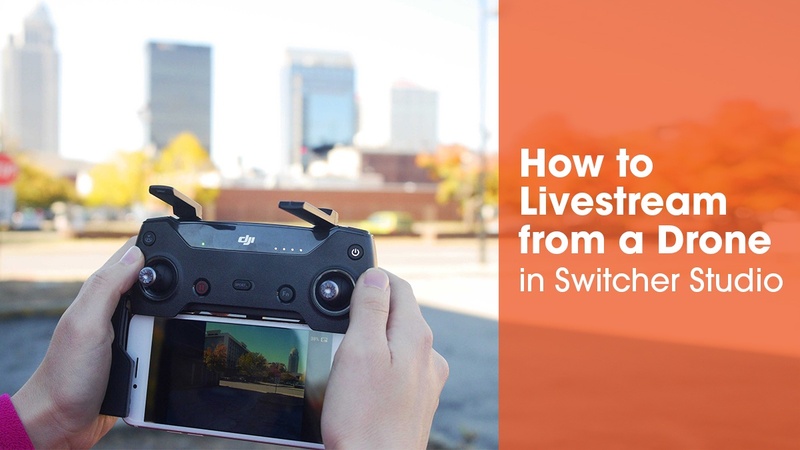 So subscribe to the Switcher blog to get all the latest livestreaming strategy and tech tips straight to your inbox. And, of course, follow us on Facebook to see our own weekly live show, #StreamSquad, on Wednesdays at 2 p.m. ET, where we cover (and try out!) everything you can do with live video.